The joints experience a significant amount of stress and strain throughout life. From bearing the body weight to endlessly moving in daily activity, joints are prone to a range of injuries and diseases as is the case with any part of the body. Joint pain is known as arthralgia and may affect any joint in the body. It can be associated with other signs and symptoms like stiffness, swelling of the joint, redness of the overlying skin and decreased mobility. Pain may occur in small or large joints only or in both simultaneously. Similarly, the pain may be isolated to a single joint (monoarticular pain) or affect several joints at the same time (polyarticular pain). Some types of injury and certain diseases tend to affect specific joints, while at other times the disorder may not be as discriminatory and there is generalized arthritis. The knuckles refers to the joints of the fingers and toes and in particular to the bony bumps located by these joints. The term is more common when referring to the hand and especially to the head of the hand bones where it meets the finger bones. The hand knuckles are most prominent when the hand is clenched into a fist. It is easily injured when the hands and fingers, particularly when clenched, strikes against any object because there is very little tissue surrounding and protecting it. 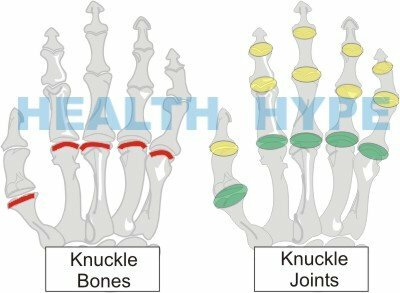 However, there are several other causes of knuckle pain that may not be caused by injury and can be related to underlying diseases with severe complications. The hand bones (metacarpals) have three parts – a base, shaft and head. The base articulates with the wrist bones (carpal) and the head articulates with the finger bones (phalanges). 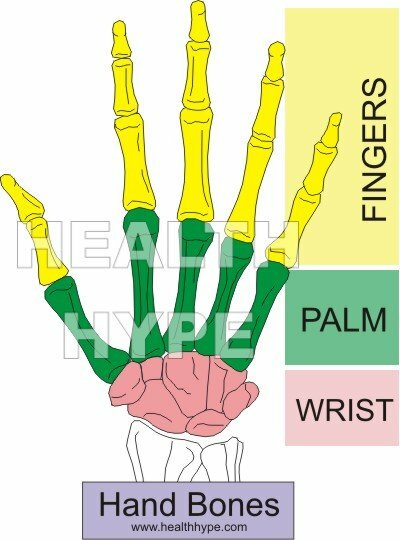 Each finger has 3 bones (phalanges) except for the thumb which has 2 bones. The finger bones closest to the hand bones are known as the proximal phalanges. Between the two finger bones (absent on thumb) is the intermediate (middle) phalanges. The outer lying finger bones are known as the distal phalanges. Hand-finger joint – metacarpophalangeal joint (MCP joint). 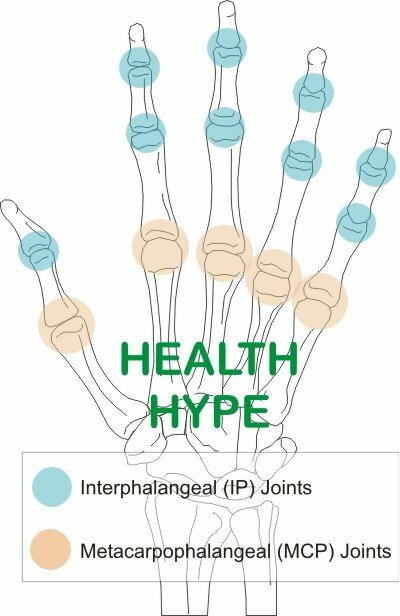 Finger-finger joint – interphalangeal joint (IP joint). Knuckle bone pain is more commonly a result of injury, particularly with an impact on a hard object. Knuckle joint pain is often caused by overusing the hands and finger leading to muscle, tendon and joint strain. However, it is sometimes difficult to differentiate between pain in the bone or joint and therefore knuckle pain from both areas is discussed collectively. In most cases this causes soft tissue inflammation and rarely injures the bone itself. The muscles and tendons may be strained and ligaments in the area may become stretched (sprains) or even tear. The bone can also be injured and sometimes even fractured with a very hard blow. Stress fractures are tiny cracks in the bone when the bone is unable to withstand force on it any longer. Although not given as much thought as with wrist pain, overuse may arise with long hours of typing and using a mouse, mobile phone or video game controller. Most of the time this is linked to carpal tunnel syndrome (CTS) of the wrist but overuse can also affect the knuckles. Sometimes there is muscle cramps and tendinitis (tendon inflammation) which affects the back of the hand and extends to the fingers. This may arise with sporting injuries and trauma but can also occur with overuse of the hand and fingers. Other causes of injury like exposure to harsh chemicals, burns and insect bits tend to affect the superficial tissue like the skin and tissue underneath it rather than the bone or joint itself. Septic arthritis – joint infection. Cellulitis – subcutaneous tissue infection just under the skin. Impetigo or erysipelas – skin infections. In most of these cases the infection is caused by bacteria and frequently involves those bacteria that naturally live on the skin (normal skin flora), like Streptococcal epidermidis or Staphylococcus aureus. 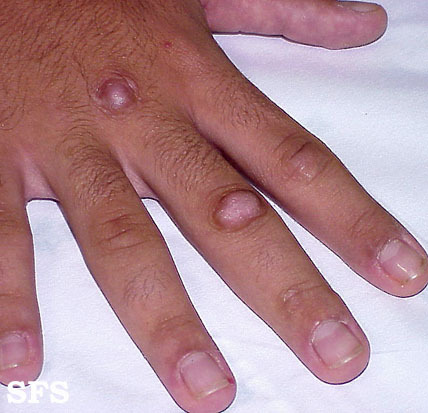 There are various disease that may arise in and around the knuckles which are not related to an infection or injury. Sometimes these conditions arise after an injury or infection while at other times it appears to occur spontaneously. In terms of the latter, it can be related to other disease processes like autoimmune disorders where the immune system turns on the body’s tissues thereby causing inflammation. Bones, muscles, tendons and joints are the main structures of the hand. Most hand diseases therefore affect one of more of these structures. Myositis is inflammation of the muscles usually not associated with injury. Of the different types of myositis, it is inclusion body myositis that is more likely to cause prominent muscle pain. Tendonitis is inflammation of the muscle tendons which secure muscles to bones. The tendons at he back of the hand are often affected with overuse. Osteoarthritis is where the cartilage lining the ends of the bone on either end in the joint becomes worn out and damages the bones. Gout is a build up of urate crystals in the joints thereby causing joint inflammation. Rheumatoid arthritis is joint inflammation due to the immune system attacking the joint lining. Peripheral neuropathy is any nerve disease of the limbs which may cause pain in the affected area without there being any injury or inflammation of the other tissues. The finger joints are a common site for rheumatoid arthritis while involvement of the thumb should raise concerns about osteoarthritis (OA). Crystal-induced arthritis – accumulation of uric acid crystals or calcium salts. Septic arthritis – bacteria, viruses or fungi may gain entry into the joint. Reactive arthritis (Reiter’s syndrome) – autoimmune response triggered by an infection usually outside the joint. Psoriatic arthritis – arthritis associated with psoriasis vulgaris (skin disease). Juvenile idiopathic arthritis – arthritis in children due to unknown causes. 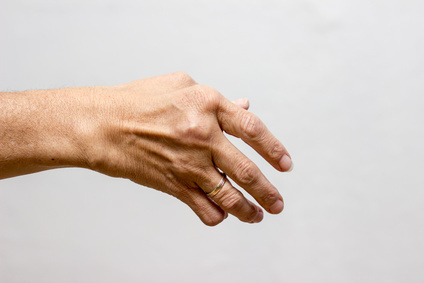 It is important to note that some of these types of arthritis are not frequently seen in the finger joints but need to be considered as possible causes. The skin overlying the knuckles may at times be the cause of pain. Some skin diseases are overt and can be clearly seen while others may be more subtle presenting with symptoms like pain or itching yet the skin appears healthy. Skin ulcers (open sores) with severe injuries, infections and diseases like psoriasis, allergic and irritant dermatitis. Infections – cellulitis, erysipelas, fasciitis and impetigo. A number of these skin diseases do not typically cause pain but the compromised skin can be prone to injury and infection which is then painful. Knuckle pads. Picture from Dermatology Atlas, courtesy of Samuel Freire da Silva, M.D. Tumors in the hand, either benign (non-cancerous) or malignant (cancerous). Peripheral artery disease (PAD) where there is narrowing of the artery to the upper limb and can lead to acute limb ischemia if suddenly blocked by a blood clot. Blood clots, apart from PAD, can arise with phlebotomy for IV drips or withdrawal of blood. Lymphangitis which is the inflammation of the lymph vessel thereby affecting lymph drainage. Raynaud’s disease where there is a sudden narrowing of the tiny blood vessels in the hand. Thromboangitis obliterans (Buerger’s disease) where there may be a blockage of the blood vessels supplying the hand. Vasculitis which is inflammation of the blood vessels. There are other types apart from thromoangitis obliterans. Avoid activities that may require intensive hand movements. Rest the hand in the natural position with the finger slight drawn in to the palm. Use a hand or wrist brace where necessary. Hot and cold therapy may help to ease some of the discomfort as advised by a doctor or physical therapist. Anti-inflammatory medication and painkillers may be helpful but only when prescribed by a doctor. Try to have short breaks of about 15 minutes for every 45 minutes to 1 hour of hand activity. Hand exercises as advised by a physical therapist may be useful. The video below is a guide to hand stretching exercises which may be useful for preventing muscle and tendon strain. It is always advisable to first consult with a doctor or physical therapist before commencing with any such program.